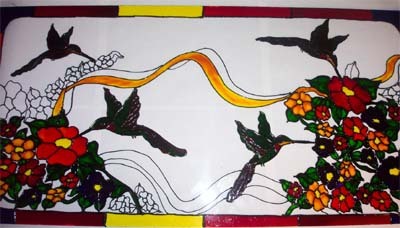 I use Glass Eye 2000 to design my painted glass artworks. This design is a recent commission that taught me a few lessons. It started with my client, Kittie, giving me a drawing of a hummingbird and a few flowers. I created a design based on her drawing at the dimensions she specified. When I finished the design I exported a JPEG image for Kittie's approval. She amusedly informed me that it was indeed beautiful, but the size was wrong: it was supposed to be horizontal, not vertical! Hmm... I guess if the paper were held in the other direction... A revision was in order. I deleted the border, simply moved all the flowers and hummingbirds, added another hummingbird, and sent the next revision out for approval. Kittie gave the go-ahead and I began painting. I used a Plexiglas panel because the piece would be inserted into an existing window frame with trim placed around the edges to secure it. I had created similar panels for other clients who were very pleased with the outcome. I use oil-based glass paints. I especially enjoy creating my own metallic pigments, which are exceptionally beautiful when you see the results in the hummingbirds. While I was painting, I waited too long to wipe off a few paint drops and they left a cloudy spot. So, acting on a suggestion from Kittie, I revised the design just a wee bit more. Since I had already leaded and painted the panel, I didn't change the existing design but simply added some freehand elements to conceal the smudge. I learned a few things creating this commissioned panel. First, ask all the "stupid" questions you can, even if you think you know the answers. The vertical/horizontal redesign would have required starting from scratch if I hadn't had Glass Eye 2000! Second, listen for the nuances in spoken words. When Kittie asked me what the hummingbird in the top left was "doing", I didn't catch on immediately (I thought it was "flying") but I then understood that she wanted each hummingbird to have a destination. I added more flowers so that the little hummer wouldn't be "lost in space" so to speak. I also added another layer of ribbon and a few more flowers to fill in some of the "bare" spots, and she was satisfied with the results. I am learning some time-saving design tricks. Here, I started with a rectangle of the required size. Then I created the elements inside, such as the hummingbirds. I created one, copied and pasted, and then revised and sometimes flipped each one. Similarly with the flowers, I created the basic design, copied and pasted, resized, and moved into place. 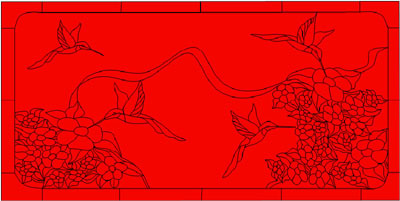 Finally, I created the lines for the leaves and ribbon. I turned on gridlines to help me create the edge border. For the rounded corners I drew a straight line, added a knot in the middle, then moved that knot to get the curve I wanted. When I've finished a design I pick a bright color and make a color box around the entire design. This tells Glass Eye 2000 to color all the pieces. By seeing areas that do not fill with color I can easily tell where my lines are not connecting or where knots are needed. After it passes that test, I double-check with the Suggest command. Of course, I don't forget to Undo to get my colors back! Since all my pieces are hand-painted, I can be lenient with my designs and not include the extra lead lines that are needed for traditional stained glass. 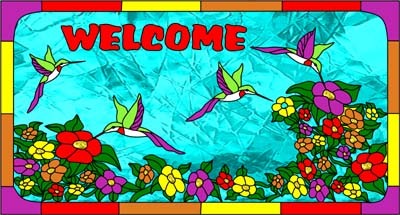 Here I thought this would be a nice design to use as a welcome sign for porches, and just happened to have some glass panels of the perfect size for which Hubby had made frames. The AutoTrace Text feature makes adding lettering a snap! 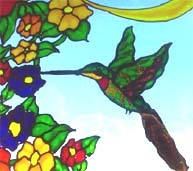 Mary has been creating hand-painted glass artworks for more than five years, often making them out of glass recycled from other windows. Her design "Daddy's Roses" was the April 2006 Design of the Month. Mary is currently working on numerous windows and lamps for a show in May and continues to increase her skills in Glass Eye 2000. 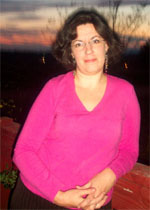 Visit her website to see more of her work or chat with her by email.